In Ludlow, the Baptist church was officially organized in 1825. Previous to that there were Baptists in the town, but they were usually members of the churches in Andover and Chester. In 1800 the first baptism of that denomination took place and the second took place in 1806. The baptisms were administered by the Elders of the Andover or Chester churches. Church meetings were generally held in a member’s home because they had no church building. Between 1806 and 1819 the Baptists held some meetings in the congregational Church. This church was built in 1806 and was located at the head of Depot Street somewhere near the entrance to the cemetery. In 1819, Elihu Ives built the Union Church on High Street (where the Black River Academy is) and the Baptists held meetings there until they built their own church in 1840. In June of 1821, the Baptists of Ludlow held their first business meeting to discuss organizing and building a church. The members voted to do just that, but it was four more years before they got the project under way. At that time most of the Baptists in Ludlow (around 40) were members of the Chester Baptist Church. A few belonged to the Andover church. The Ludlow Baptists finally received permission from the Woodstock Baptist Association to organize their own church. In 1826 they obtained their first minister. The minister preached alternate Sundays in Cavendish and Ludlow. Each congregation paid him $165 a year and shared the expenses of keeping his horse. Church services were still held in the Union Church. In 1835, the Baptist Church in Ludlow suffered a schism. Some members, dissatisfied with the church, broke away and voted to organize and build their own church. To raise money for this they sold the pews in the new church for $15 to $60 apiece. After the split members of the original organization disassociated themselves from the Woodstock Baptist Association. In 1838 the members of the new church joined the association and took the name of The Baptist Church of Ludlow. They finally built their own church in 1840. The cost to build the church was $2024.36. At this time they also severed their relation with the Union Church on High Street. After 54 years, in 1892, the Baptists decided to build a new church on land donated by William Harris Walker. They tore down the old church and built the church we see today. Finished in 1893, for a cost of $11,079.52, it is a superb structure. It was designed by George H. Guernsey of Montpelier. Guernsey was a carpenter by profession but had a knack for designing buildings. Other Vermont buildings he is known to have designed are in South Royalton – “The Block” - and in Montpelier - St. Augustine’s Catholic Church. There are also other buildings in Vermont and New Hampshire designed by him. We have been told there is an exact duplicate of the Baptist Church in Laconia, NH. Only the towers have been reversed, with the steeple on the left instead of the right. In this old photograph from 1912, you can still see the horse sheds behind the church on the right. The side entrance to the church (High Street side) was the carriage entrance. Gentlemen would pull up to that first step (which is higher than an ordinary step) to let the ladies and children in the carriage disembark. They would then proceed to the sheds to stable the horses and then go in to church. Upon leaving the process repeated itself in reverse. Today the church looks much the same but there are no horse sheds. The land for the sheds was owned by the Walkers. The church was allowed to use it as long as there were horse sheds. When the sheds were no longer used and later removed in the late 1950s, the land reverted back to the Walker family. An interesting feature of the church are the memorial windows. The north window was donated by the descendants of Deacon Andrew Pettigrew who conducted many of the meetings of the early Ludlow Baptist Church. 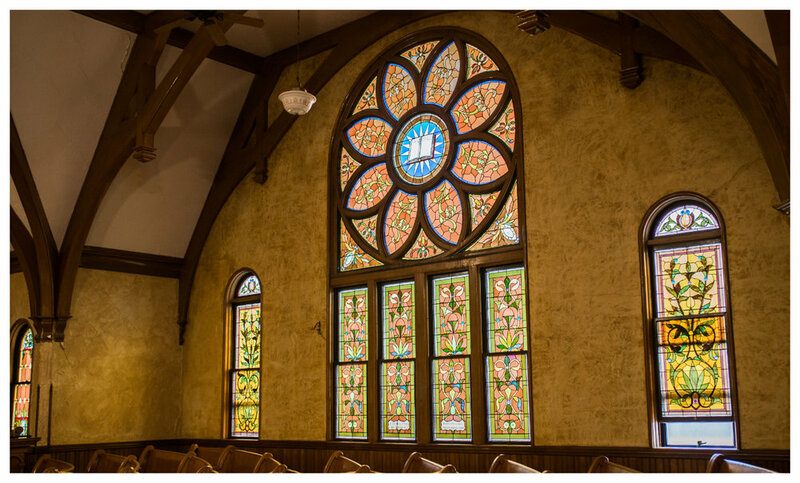 The south window was donated by Mrs. Willard Johnson. The east window which faces the green, was donated by Merrill Gasseu of Worcester, Massachusetts. The oldest part of the church is not a part of the structure, but is the pipe organ. This organ was originally in the first Baptist Church built in Ludlow in 1840. A listing of the last several pastors from mid-1940’s to current is provided below.